Having been reserved for deep diving enthusiasts and military divers in the past Poseidon is now bringing Rebreathers to the sports diving market. With the fully automatic Mk VI Discovery you will experience a new way of diving, safe, quiet and almost as long as you want. The advanced control system takes care of the rest. It is like a modern car, electronics handle brakes, stabilizing systems and all other gizmos to make driving safer. The innovative Mk VI Discovery is just like that. Using state of the art electronics and sensor technology it is designed to provide the sports diver with all the benefits of rebreathers without the current drawbacks. Safer diving with less risk of decompression sickness, no bubbles and quieter to allow you to experience the marine life up close and longer dives meaning never having to ascend before your buddies again. 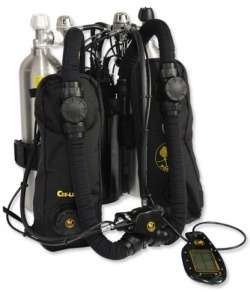 No other rebreather is smaller, lighter and more user friendly then the Discovery MkVI. But then again, no one has ever built a rebreather aimed at the recreational divers. It only weighs 18 kilos (39,6 lbs) fully gassed up and ready to dive and that is less than what many dive tanks weigh. With out the tanks and the canister, the Discovery MkVI only weights 8 kilos (17,6 lbs) and that makes it very suitable for travelling. The Discovery is fully automated and the computers takes care of everything but the dive experience... we leave that up to you! The Discovery MkVI is only sold to divers certified on the unit and that the unit is only delivered to an authorized dealer. DIVE Northampton is not only an authorised Dealer but carry these units in stock, ready to start your training immediately. Click here for information on how to purchase your unit. DIVE Northampton also offers a full range of courses from non-divers through to Instructors. To learn more about the Rebreather Courses available, click here. Poseidon Diving Systems announced today their program for technical upgrades of the Discovery MK VI rebreather. The program will deliver 3 key upgrades: 40M Deco, 45M Tri-Mix and 60M Tri-Mix. All current owners of Discovery MK VIs will be able to use these upgrades as they become available. Upgrade pricing and availability will be announced at DEMA in November, along with certification levels required for each upgrade. All current and future Discovery MK VI owners will be able to use these upgrades.